The next installment of GS ski technique analysis started with analysis of a GS turn and The fine points of ski technique, now turning to some of the finest or most advanced points of ski technique. Mastering these finer points of technique make the difference between the best and the rest. This is simply my view on high performance skiing and you are welcome to gracefully disagree. Note that after the transition, frames 5-8, the new "platform" is created, i.e. she is already on the new outside ski, but there is no pressure. Even as she is extending the new outside leg back and keeps moving the body forward, there is still no pressure on that outside ski. This is a critical element of a great WC-level turn: delay and be precise with pressure application - it takes too long to explain all the details here, so we'll do that in another post. In frame 4 she is already centered on the skis - which must have been back. 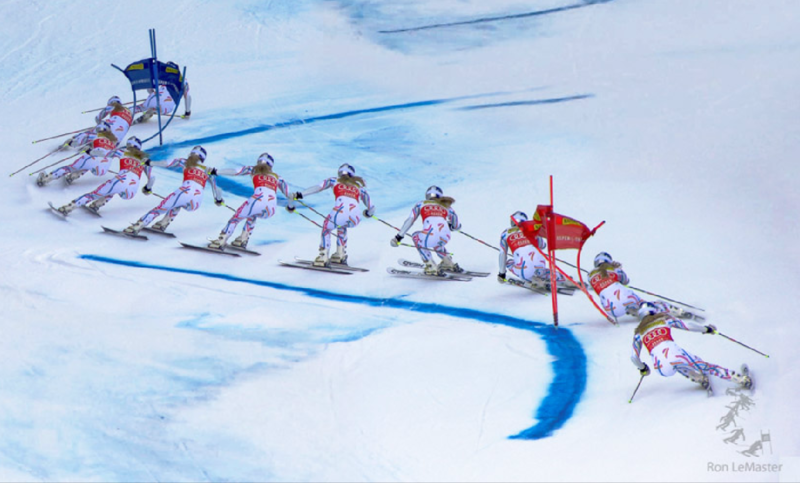 Normally, the skis accelerate forward coming out of the turn and there is a separate movement to re-center, by pulling the skis back under the hips. This is something that happened between frames 3-4. She continues to pull back the feet strongly and keep them under the hips throughout the rest of the turn, frames 5-9 quite visible. This is possibly the single most important element of advanced technique. Only the best racers do this and most of them don't even think about it anymore, it has become a reflex and you can generally tell a good turn from a bad turn just by looking at how disciplined the inside foot is. Look at frame 3. The inside leg is well shuffled forward... this is normal. Look at frame 4. The lead has not changed, the skis are evenly matched. Tips are even. Now it gets interesting, for those of you not in the know... while for those of you that read the Focusing on the Inside Ski post, this is just a refresher. Look down at your skis as you begin your turn. I bet 80% you will have changed the lead and shuffled the new inside ski forward. Just look down at your skis... WRONG! Now look at frame 5: skis are matched. Frame 6: skis are matched. Frame 7... you guessed it: skis are matched. Frame 8... you get the picture! The first thing she does is to pull the inside ski back so much it would hurt you if you tried... now go on, try it. You can also see that there is no weight on it either through this entire turn. That's right, all the weight is saved for the outside ski. Also, in frames 6-7 you can see how the inside knee is tipped into the turn, shins parallel while the hips are held up. This is perhaps the most important element of inside foot discipline. You can see in frames 5-9 that as the angles build, the inside foot is flexed and pulled up to her chest, to create the vertical separation between the skis that she needs to allow the angles. The timing of this is of the essence. Viewed 1114 times ( | Print ) this page.